A challenging but rewarding RPG experience. After having success with their Secret of Mana release outside of Japan, Squaresoft decided to try a different approach with their next action RPG release Secret of Evermore. While Japanese gamers would get the true sequel to Secret of Mana in the shape of Seiken Densetsu 3, US gamers were treated to what would be the first Squaresoft RPG developed by an American development team. 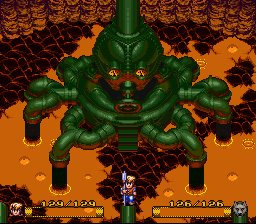 And while Secret of Evermore wasn't quite as epic in design as Seiken Densetsu 3, the game did feature a distinctly American theme that made it stand out from many of its Japanese counterparts. It also created quite a split among RPG fans upon its release with some loving the game's unique approach and others longing for the true Secret of Mana sequel Japanese gamers were already enjoying. So how exactly does the game stack up against the many other great Super Nintendo RPGs available for the console? Anyone that's played Secret of Mana will immediately feel right at home with Secret of Evermore. It obviously borrows heavily from almost every aspect of play control found in Mana and even improves upon it in some places. You start the game off with a bone as your weapon, but each area in the game holds new and more effective weapons, you just have to locate them, which is sometimes easier said than done. As in Mana, you can swing a weapon, but it must then recharge before you swing it again, at least if you want to do any type of real damage with it. You'll also find the return of the easy-to-use "ring" menu system that makes choosing game options quick and easy, even in the heat of battle. Since this is an action RPG, you will have to learn effective attack strategies against the various enemies if you're going to have any success against them. Boss fights are where you're going to see the most challenge in the game, with a couple of the bosses being downright vicious. While you do have your dog to help out in battle, he's more for show than anything else, so you'd better make sure you continue to level up and obtain better weapons if you want to last for any significant amount of time in the game. One new element that Secret of Evermore introduces is "Alchemy." This allows you to combine two unique ingredients into a magical potion of sorts. There are tons of different combinations that you'll learn as the game progresses and these will come in really handy for the boss fights and stronger enemies you'll run into later on in the game. It also forces you to spend a lot of time searching for the ingredients you need to create these magic spells, which adds yet another unique gameplay element to the overall experience. The play control feels quite fluid for the most part and having to wait as your weapon recharges back to full power does bring a great deal of strategy to battles. The game's sudden difficulty bursts can be a bit tricky to deal with at times, but as long as you continue to do battle every chance you get, you should be strong enough to tackle most areas of the game without the need for too much additional grinding. It might not be as balanced as Secret of Mana, but it's still a very playable action RPG. Graphically, Secret of Evermore is quite a departure from most previous Square RPGs. While you'll notice a few similarities, the vibrant use of color is all but gone. The rendered visuals give the game a less colorful, but much more realistic look. You'll also notice that the variety between the many areas of the game is staggering. While the character and enemy animations isn't quite on a level as say a Chrono Trigger, they're still quite a bit better than those found in Secret of Mana. One rather impressive aspect of the game would have to be the bosses. Some are absolutely immense in size and all feature some very cool animations to give them that little extra touch of realism. 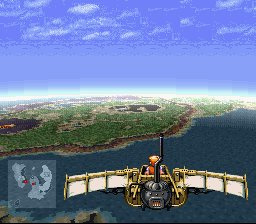 As in most Super Nintendo games, there is the trademark Mode 7 appearance which pops up anytime the air shuttle is involved, but it's nothing that we haven't seen 100 times before in countless other Super Nintendo release. Overall the rendered visuals give the game a very unique look and feel and are a nice change of pace from the overly vibrant visuals of its predecessor. The soundtrack in Secret of Evermore is unique in the way many of the tracks blend so well into the background of the various areas they're used in. At times you won't even really hear much in the way of music, and even when you do it's in such an ambient way that you won't really notice it much, yet it almost perfectly sets the mood for the area it's currently playing in. For instance in the prehistoric area, you'll hear the faint tribal drums in the background and occasionally some rustling brush or animal noises. It's quite unique the way the composer was able to capture the mood for the various areas of the game without having the music stick out so much as is so common in many other RPGs of the era. The musical score might not be on par with that of a Chrono Trigger or Final Fantasy III, but it's got it where it counts. While it's certainly no Seiken Densetsu 3, Secret of Evermore ends up being quite a refreshing take on the Secret of Mana gameplay formula and serves up one of the more unique and interesting Squaresoft RPG story lines of the 16-bit generation. The high level of difficulty at times might turn some gamers off, but if you've got the mettle to stick it out, you'll find that the quest is one well worth experiencing. There will always be RPG fans who resent the fact that gaming audiences outside of Japan received this game instead of the true sequel to Secret of Mana, but those who can get past that will find a very enjoyable action RPG experience that should challenge even the most seasoned fans of the genre. 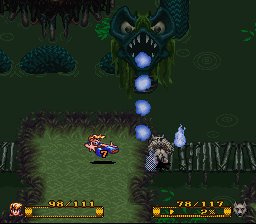 It goes without saying that if you enjoyed Secret of Mana, you'll likely find a lot to like with Secret of Evermore as its very similar in style and presentation, not to mention fun factor. A couple game breaking bugs, but other then that I thought this was an amazing game.... I was sad at the end though... He went through all that and nothing really changed in the end, it was like it never happened. Also, some of the best music in a game period. love this game. Replaying at the moment actually. Great review for a great game. While I consider Secret of Mana the better of the two, I had a great time playing this game. Hope this comes to the VC! This game was the reason I bought a Super Nintendo console long time ago. The ring menu and the music were amazing. I remember playing this as if I havent anything more to do in this world. love the square games form back then. i always hated this game for some reason... i always thought it had bad level design but what do i know? One of my favorite SNES games.. oh the memories. Hurry up Square and get it on the VC! Even though Mana isn't good I'd really like to give this a go. This is a lot better than Mana, despite the disappointing lack of 2P mode. I ended up getting stuck at some dungeon in the desert, I think. I forget. Very fun up to there though. It has a very good sense of humor for a video game, and the world just has more character than Mana all around. A difficult action-oriented RPG? Awesome! I always love a challenge in a video game. I should look into this sometime. An 8? Someone is blinded by nostalgia, imo. I'd give it a 5, personally. I actually prefer Evermore to Mana myself. Just me personally. Wow, this game looks epic! There is a glitch in SoE, I don't remember the exact details but it involved using an item out of sequence near the end and the item being unavailable again, and I needed it to get to the next stage, on a rocketship I believe... I even called up Nintendo and they basically said "Yeah, your screwed." I still have the cart, one day if I get a cheap SNES maybe I will get my long overdue revenge upon this game. Excellent review Corbie! I never owned this game but I did rent it. From what I played, I really enjoyed it but I didn't beat it. I'm still kicking myself for never buying it. I really hope that this game comes to the Virtual Console because I would feel pretty sad if I never get the chance to play it again. Secret of Evermore has one of the best boxart covers I've seen. EPIC!!! Never played this game, but have always wanted too. Looks fun. I have never understood why SOM2 hasnt found its way to a western release at all. Ahhh the good ol' Secret of Evermore, I love this game!!! I thought that game was too easy, despite 2 or 3 bosses. Space is my least favourite level, because u beat it in 10 mins and the weapons are way to strong for the level. The final boss is a joke... not really challenging. The alchemy system is very tricky. It's hard to level up your alchemy because the ingredients are hard to find or expensive to buy. I played the rom....(please don't hate me) and I must admit..... this is nowhere near the excellence of Secret of Mana 2. a.k.a. Seiken Densetsu 3. I did enjoy the battles but the game's difficulty was too.....wishy-washy (funny term i like). Kind of reminded me of a few devil may cry games. Good and bad thing. When one takes into consideration that I still have yet to play Mana AND Evermore, I don't know which of the two is greater. Such a good game. I really miss this one a lot. Great review, Corbie. @Corbie - agreed. Mana is a great game and with 3 players it's quite an achievement, but going back as an adult and playing both, I had a lot (like, a LOT) more fun with Evermore. Alchemy was much more fun to level than mana magic, the game was harder, the boss battles were much less tedious (and better on all fronts) and the music is as good as 8-channel SPM can be. Too bad Jeremy Soule went all soulless-ambient/generic orchestral with his Morrowind soundtracks....this game really had something special going on. Hurray! This was the review I've been waiting for! One of my favorites on the SNES! I hope it comes to VC soon! I loved, I mean, just, LOVED Secret of Mana!!! I've never played this one and I REALLY hope it comes to VC in the near future! Great review Corbie! 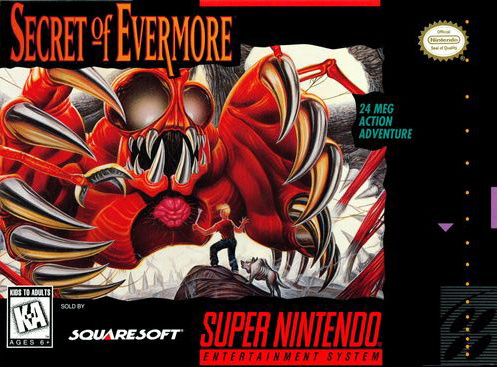 I never got to play Evermore since my friend only had Secret of Mana for his SNES and I played that instead. Looks good though. Hope it comes out... but after the Soul Blazer trilogy . I want those three games more. I'm sad to hear you say that, Mr. Saturn. Kind of baseless to assume it's nostalgia. I for one didn't play either game until a couple years ago when I got both around the same time, and I greatly prefer Evermore. Mana's world is just generic and boring while Evermore is a real treat. Its sense of humor may not be up to par with your game of origin, but it's still quite good. 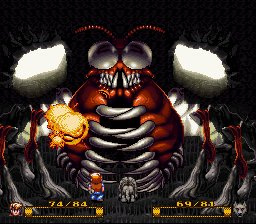 Secret of Evermore is a fantastic game. I still prefer Secret of Mana (and Seiken Densetsu III, for that matter) because I really like the more fantasy world that Mana creates, whereas Secret of Evermore is more of a time traveling world (I also just have more general nostalgia with Mana as I was younger when I played it ). But nevertheless, Secret of Evermore is still a fantastic game!!!! I love the B-Class movie humor, and you've got to love the name of the main character's hometown (Podunk lol). I also thought it was very interesting that while you thought the whole game you were traveling through time it turned out that all of those places were really just different parts of the same world. That was an interesting twist!!!! As always, great job Square (I still much prefer the name Squaresoft to Square-Enix, but I suppose that it's the quality of the games that count (I suppose... lol)), and excellent review Mr. Corbie!!!! Thanks for all of the hardwork that the Nintendolife staff puts into this site!!!! God bless you guys!!!! Easily one of my favorite childhood SNES games. Must've played it a dozen times at least, and beat it probably two or 3 times. Unfortunately if I remember correctly, just like in Earthbound, there was a point in the game where you could royally screw up your save by doing something the wrong way and then you wouldn't be able to progress any longer. Can't remember what it was exactly, but just like in Earthbound, when I stumbled upon it (after years not playing) I'd often go "Oh right, supposed to do this" (when in fact I WASN'T supposed to) and would break the game which would discourage me from restarting and trying to beat it. Still, wonderful game - wish it didn't get such an unnecessary bad rap from Mana fans. Couldn't get through the first hour or two of Mana after playing Evermore... I just don't get why they hate it so much, I've never said Mana was bad, but it's no Evermore.